If you’re looking for a grand day out tomorrow (Saturday 29 March), look no further than Overbury Farms near Tewkesbury who are holding their lambing day. It’s billed as a great family day out and you get to learn all about how the farm works and what goes on behind the scenes. You can also enjoy a tractor tour (the first one is at 10 am and the last at 3 pm) around the farm (ideal for dad and the kids) or a cookery demonstration (perfect for mum). The price of the lambing day is £5 for adults and children get in free. To find out more about what sounds like a great day out, for the whole family, check out the Overbury Farms web site. We also have a big apology to make to Nicola at Pouch Bags. Nicola makes the vintage peg bags, which are one of many great new products in the Wiggly catalogue, and in the rush we slipped up and forget to mention her web site. 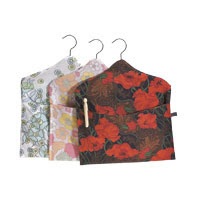 Nicola makes these unique peg bags from vintage material so not only do they look fab they are also eco-friendly. In addition to making bags in all shapes and sizes, Nicola also finds time to write her own blog and has, amongst lots of great posts, reviewed the bokashi system. Hannah’s been busy with her paper potter and above you can see the leek seedlings coming along nicely. March is a good time to lift and divide perennial plants. Plant summer flower bulbs in pots in the greenhouse. Prune last year’s growth on summer flowering clematis. Plant early varieties of seed potatoes. You just have time to plant out bare-rooted trees over the next week or so. Protect blossom on peach and nectarine trees from frost and, if in a greenhouse, hand-pollinate with a soft brush. Mulch the base of trees with a layer of garden compost, but avoid the trunks as it could cause the bark to rot. Tidy ponds by clearing up any plant debris on the margins, remove leaves from the water and plant marginals. 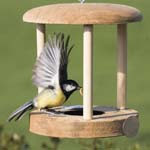 Sow celery seeds in pots this month and next in the greenhouse. Tidy ponds by clearing up any plant debris on the margins and remove leaves from the water. 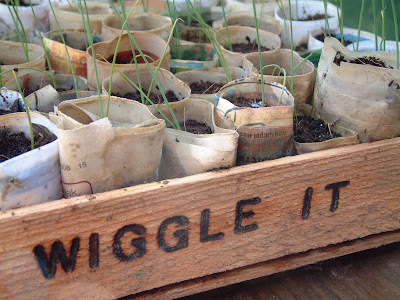 Welcome to the March 25, 2008 edition of the Wiggly Wigglers carnival of green gardening. Tiffany Washko presents Now Is the Time to Pick a CSA posted at Natural Family Living Blog. Margaret Mary presents William Robinson and the Wild Garden posted at Earthly Paradise, saying, "This article examines the work of William Robinson, who, along with Gertrude Jekyll, revived the notion of the "wild garden" and helped pave the way for the organic gardening movement." Sagar presents GreenDev: 50 Environmentally Friendly Apps, Hosts and Resources posted at Virtual Hosting. Louise Manning presents How much food do we throw away? posted at The Human Imprint. Stephanie presents Garden Planning - Taking Inventory of My Pantry posted at Stop the Ride!. Jessica Jones presents Lasagna Gardening posted at Practical Nourishment. Lucynda Riley presents Tin Can Herb Pots posted at A Crafty Nature. Lucynda Riley presents Terrariums posted at A Crafty Nature. Dave Truman presents Avoiding Weeds In Your Vegetable Garden posted at Growing Vegetables. Andy Boyd presents Top 20 Zen Gardens From Around The World posted at ProTraveller, saying, "Mostly in Japan (not surprising) but have included the Portland Japanese garden. :)"
Jason presents How to Build a Square Foot Garden posted at The Frugal Dad. a carnival of green gardening, blog carnival. Whilst potatoes have been eaten in Peru for about 6,000 years, here in the UK we have “only” been eating our favourite vegetable for nearly 500 years. Potatoes are a great way to prepare soil for the planting of other crops and are easy to grow. Seed potatoes are those selected as being blemish and disease free. Whilst not strictly necessary, you can leave potatoes to chit prior to planting to encourage sprouting. Depending on the soil temperature, your potatoes should emerge from the ground after a couple of weeks. When the plants are about 12 inches high you should bank up the soil along the row to ensure that the potatoes will grow deeply, away from the light, to prevent them going green.